Size: 14 by 25 inches on an 18 by 26 inch page. 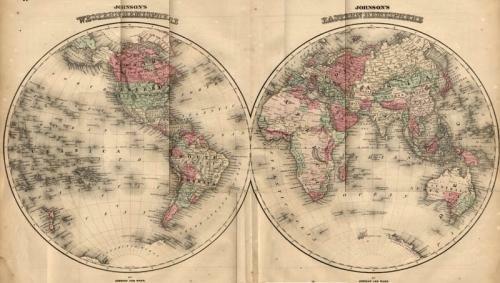 This is an original handcolored engraved Pre Civil War era antique map from an 1860 edition of "Johnson's Family Atlas." A classic Johnson map that shows large areas of unexplored territory particularly in Africa and Australia. Of note: Alaska is Russian territory and Antartica is ill defined. It is printed on heavy paper with overall tonal ageing as expected and an occassional foxing spots, mainly in the margin area. There is some very small chipping around the edges although this should not affect framing. Overall in very good condition with an antique finish.